Jill Caren, owner of a nonprofit website design agency, recently completed a case study for the project, Steps for Change. Her agency, 2 Dogs Media, wanted to enable peer-to-peer functionality. What was the solution? 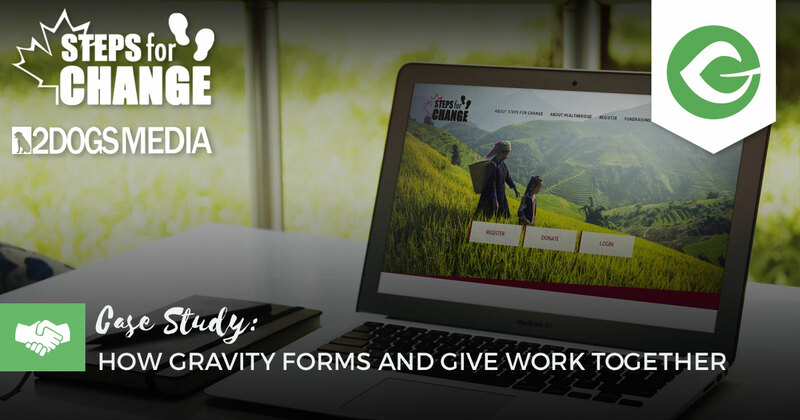 Give and Gravity Forms — they are better together. The Steps for Change initiative will be live on the website from September 1 – October 12, 2017. To operate a nonprofit or cause marketing site on WordPress and make it a success, you need a mix of plugins in addition to Give. We are often asked if Give and Gravity Forms can work together to power a campaign. Jill Caren, a WordPress agency owner, developed a customer application for Steps of Change to do just that — make Gravity Forms and Give work together. Steps for Change is an annual campaign that mobilizes HealthBridge supporters around the world to walk, run, or roll in solidarity with women in Nepal and Vietnam who need better access to health and nutrition for them and their children. Participation in Steps for Change raises essential awareness and funds that help bring better health services and nutrition closer to home for vulnerable mothers and children in Nepal and Vietnam. Step up with us to support women and children in Nepal and Vietnam. 2 Dogs Media, LLC is a digital agency that specializes in nonprofit website development and SEO/SEM strategies. The website had some complex needs with a small budget and 2 Dogs Media reviewed several options before deciding on Give as the core component for this initiative and to keep costs low. Having worked with Give before, 2 Dogs Media was familiar with the flexibility the plugin offered and believed it would fulfill all the client’s needs. The client needed the ability for people to register for the initiative as either a Team, Individual, or to Join A Team – these registrations needed to create a Give single donation form post so each registrant would have their own fundraising page to promote. The fundraising pages needed to have an image, allow for custom text as well as a donation goals option for registrants and, of course, social sharing was also a must. In addition, each of the forms needed to have a registration fee and optional donation amount that would be applied to the donation goal amount. 2 Dogs Media used Gravity Forms to send the registrant information to populate a new Give donation form in draft mode. That allows the site admins to see that a new peer-to-peer campaign was created, but the admin would have to publish it first. Once the admin publishes the post, all the registrant’s info appears as a Give donation form, including the donations made by the registrant. On the home page we have a list of the top fundraisers as well as the top step takers which is pulled from the additional functionality noted below. One of the other unique aspects to this website was the need for registrants to be able to track their steps walked during the campaign. Once someone registers, they can login and be taken straight to a “Enter Your Steps” page where they can add the steps they have walked and the date they walked them. If the person submitting the steps is part of a team, their name and steps taken will be shown on the team fundraising page so they can see which team member has walked the most. While Give is not part of this specific implementation, it is just a reminder of the unique ways you can use Give to raise funds and inspire a little healthy competition! Would you like to see the site? 2 Dogs Media has the development version of the website available for anyone who would like to test out the process. Please visit this site and click register; no live donations are being accepted! This post was a contribution from Jill Caren of 2 Dogs Media, LLC.